The Order 66 Podcast is proud to present the first in a series of live Edge of the Empire games! This live play broadcast will give listeners a feel for the Edge of the Empire game through actual play sessions with new and experienced players consisting of veteran gamers, gaming celebrities, and developers. The first session will be recorded and available in the upcoming inaugural episode of the New Order 66 Podcast, and will also be broadcast live, as it happens, on Justin.tv. Please join us for the live simulcast, where you can log in, watch and hear the game, and even join other listeners in live chat as the game progresses. We'll see you all on Saturday! If you're seeing this message, you can probably tell that there are a lot of changes to the site. We've just undertaken a project to upgrade the software running the site, including the software running the HoloNet forums. While much of the technical work is done, we've got a long way to go getting the site back up and running at full capacity, with its content available to everyone. 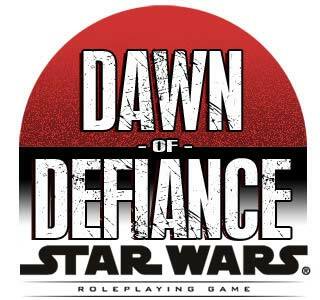 SWRPGNetwork is a website dedicated to news, content, and discussion of the Star Wars Roleplaying Game (including D6, d20, and d20 Saga Edition) and Star Wars miniatures games.